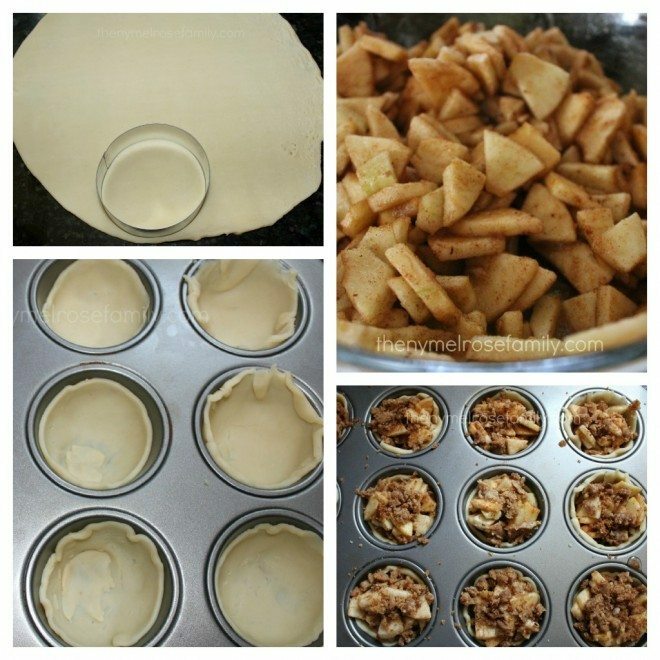 Last week I promised the recipe to my Mini Apple Pies that I shared from my Fall Tasting Party. Well, here they are! I cannot take the credit for the filling. The filling is all my mama. Before I get to the recipe, I have to share my absolute favorite contraption ever! I’m sure there’s a fancy name for my contraption, but I just love that word. The apple gets put onto a bar that you crank to a peeler on the far end, which then get put through a small hole that cores and slice the apples. It literally takes me five minutes to peel, core and cut up five apples. 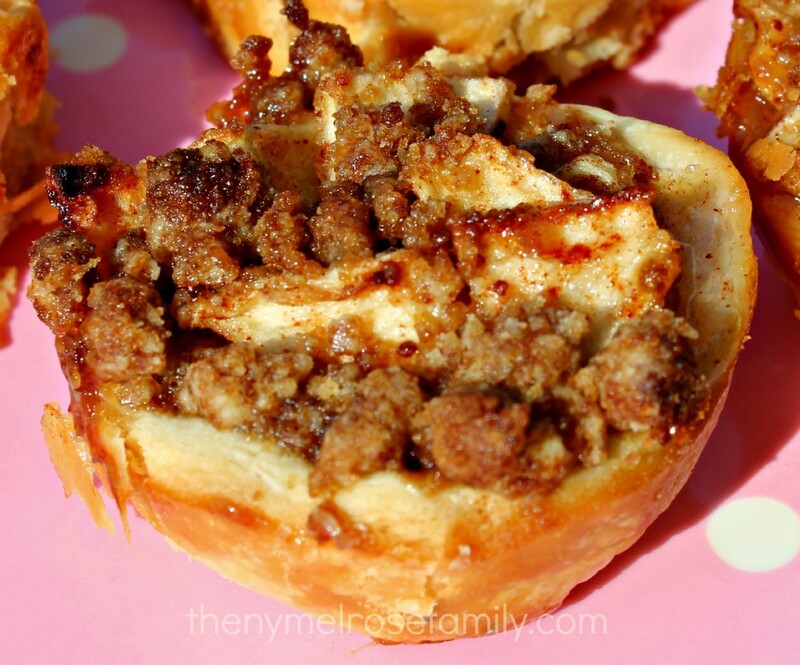 The absolute best part of these mini apple pies is the filling. 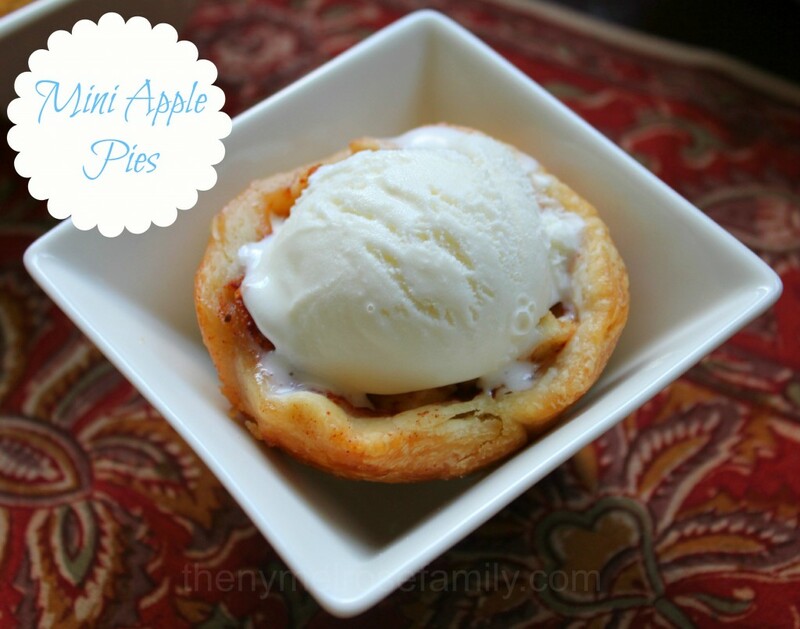 These Mini Apple Pies are a sweet, individual sized piece of homemade goodness. For the crust, I use premade crusts and a cookie cutter that will fit perfectly into a muffin tin. Drop a teaspoonful of the filling into the center of each pie crust. The filling fills 24 pie crusts. Bake at 350 F for 20 minutes or until the crust has a golden brown appearance. I chose to top half of the apple pies with a topping made of: 1/4 cup brown sugar, 1/4 cup flour, 2 tablespoons of melted butter. The topping gave the pie a candy coated taste. I actually preferred the pies topped with vanilla ice cream, rather than the sugar topping. Do you prefer a particular topping? Those look delicious! I can’t wait to try this recipe. My dad LOVES apple pie. Thanks for sharing at the Pomp Party! Pinning! These look delicious! Definitely want to try! Can’t wait to try these! Love the size of them. Thanks for sharing. These look sinfully delicious and I’m in the mood to eat the whole lot of them!! These look UH MAY ZING! I think I would like both toppings! Crunchy top and then the ice cream melting over the warm filling – yummy! These are so great! I have a list of “little” desserts and these are going on it. 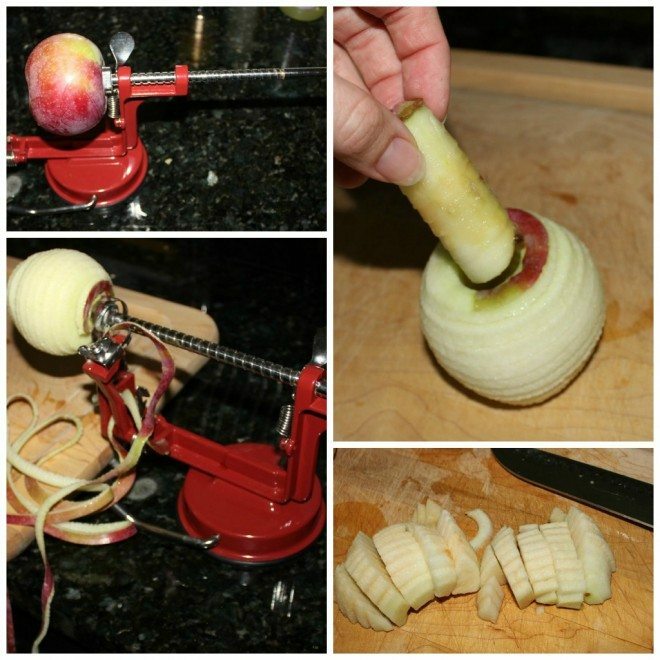 Wouldn’t that be called an apple corer. Hmmm…I don’t know but I love that it peels. those look SO delicious! and easy to make too. I am going to pick apples later this month and want to make these! I’m hosting a new fall blog hop and would love to have you join! This looks delicious! I make something like it but without the crust. I bet this would be wonderful for breakfast! Found your recipe from Pamela’s Heavenly Treats. Looks delish! Those look delicious. In my house I’d have to have both toppings. Yummy! Wow, you are torturing me here – I so wish I had my own Mini Apple Pie right now. I am not a sweet eater, but i cannot pass up anything that apple in it. Looks so good! My fingers are crossed you’ll share your creative inspiration tonight with Sunday’s Best http://www.my1929charmer.com – sharing is a good thing! Great mini pies! My sister has tons of apples from her tree, and this looks fun to make! I love the idea of a mini pie. Yum! Now those are looking mighty good! Love the recipe and the full tutorial! Thanks so much for sharing this at Mom’s Test Meal Mondays!! What gorgeous pictures. I’m salivating now! Following you on G+, I would do GFC but I didn’t see a way to. Thanks! Oh good heavens. I could eat like 10 of those. Probably not a good thing for me to visit while hungry. These look absolutely delicious and I can’t wait to try them. What temperature and for how long did you bake these? So perfect! I love anything little 🙂 Pinning and featuring tonight! Thanks so much for sharing at Mom On Timeout! Wow, these look delicious — and I just LOVE the fact that they are ‘miniature,’ too. Nothing cuter than that, in my opinion! 🙂 Thanks for sharing with us! These turned out delicious!! I used a store bought premade crust. I think next time I will take the time to make my own homemade crust. A teaspoon? That doesn’t seem like enough. Is it because it will bubble over? Looks delish! How much crust is needed? One 9″? Two? How big is the cookie cutter? Going by the width of the top of one muffin doesn’t seem like it would have enough dough for the depth of the muffin tin.